You are Larry Bain, ace plumber, of Rodent Rooter plumbing service. Your job is to install pipe through the many levels of RAT ALLEY. Rat Alley is infamous among the legions of the plumber. Rumor has it that extremely large rodents live in the maze of tunnels that make up your area. The last plumber that ventured into Rat Alley disappeared without a trace. As protection against these overgrown mice, you have been given two cats and two mouse traps. The traps you've got only hold the rats for a few seconds before they destroy them and escape, becoming super rats in the process. Your best bet is to try hit the rats in the head with a pipe while they're stuck (which you do by walking over the trapped rats, which will also render the trap obsolete). You're only given a few traps for each level, so try and catch as many rats as you can in each trap. The measly little cats you have are so scared they won't even move. Luckily, the cats most the rats away. The cats however don't scare away Super rats. Those egomaniac mice have big S's on their red chests so you can tell what they are from a mile away. Super rats eat cats, WHOLE! The only way to save the pitiful little felines is to pick them up and carry them while you see these attack rats come through the area. All these problems with running from rodents has made you nervous. Never before have you laid so many bad pipes. Well, such things are expected when you do your piping on the run, but you've still got to go back and fix the bad pipe. (a leaky pipe is a no-no). Fixing them isn't hard, but there is sometimes a large problem with finding exactly which pipe is flawed. The head office at Rodent Rooter has been very helpful through this whole mess. they've increased your supply of traps, for the duration of the project and they're pretty good about replacing cats when a Super rat has gobbled yours. the cats and traps are dropped in the maze periodically. If you don't get them within a few minutes of delivery they will be picked back up. Head office also offers a bonus for each rat you kill in the line of duty and a special bonus if you catch multiple rats in a trap. Rodent Rooter does not hold an exclusive contract on the Rat Alley piping project. Peter Pipefitter of Peters Piping Service is also brave enough (or crazy enough) to plumb Rat Alley. Competition is fierce and dirty tricks are becoming common place between you and he. Each of you has trained your cats to attack the other so you've got to steer clear of Peters cat (and he has to steer clear of yours). Since dead rats are worth money, you've also started raiding each others traps. It's a dog eat dog world out there. Who will make the most money in Rat Alley? Who will survive? To play two-player mode with the Atari, press the select button. 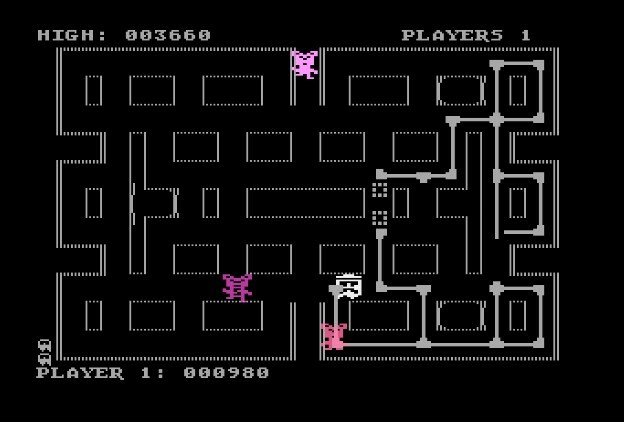 To play two-player mode with the Apple II or IBM, press 2 at the opening screen and then assign the controls for each player. Movement of your plumber with the Atari is controlled by the joystick. To pick up a trap or cat, press the joystick button while over the item. To drop the item, press the button again. Note that if you play the game through an Atari emulator, such as Altirra, you can also assign the keyboard or game pad controls instead. For the Apple II or IBM, you can define the player(s) controller(s) before the game starts. For the keyboard you can then assign the directional controls and "pickup" control. For the joystick, the stick controls the character's movement and the fire button functions as the "pickup" control. Note that for the Apple II abd IBM, you can also enable/disable sound by pressing "S". 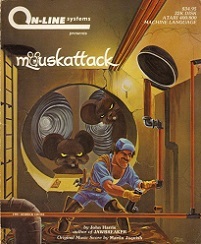 Each player starts with 3 lives and loses a life when caught by a rat.